at Cornerstone Nazarene in Wheelersburg, Ohio. 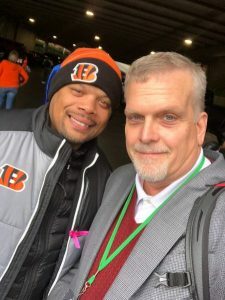 A big Who Dey to you, LaMorris, and your family. Del Duduit is the Editor of Southern Ohio Christian Voice. He is an award-winning writer, freelancer, blogger at www.DelDuduit.com, speaker, and author of Buckeye Believer: 40 Days of Devotions for the Ohio State Faithful. He lives in Lucasville, Ohio with his wife, Angie, and they attend Rubyville Community Church. He is represented by Cyle Young of Hartline Literary Agency.